It’s such a delight to see flowers blooming in the garden, it’s often hard to cut them to bring indoors. That’s the beauty of a designated cutting garden. Find an out of the way sunny spot in your yard, somewhere that guests won’t notice, and fill it with plants that are grown to be cut. Then treat your cutting garden as your own private source of bouquets to brighten your indoor spaces. Think you don’t have any space left for a new garden, even if it’s tucked away? 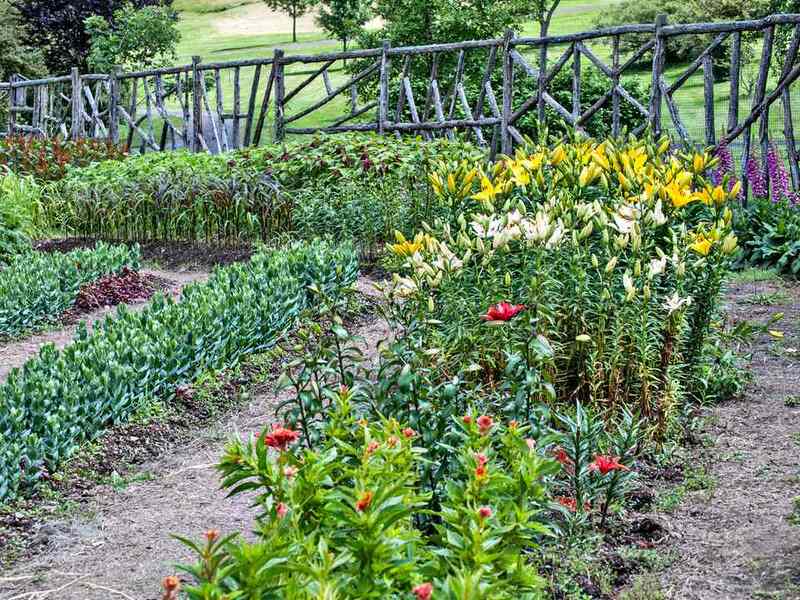 How about designating a few rows in your vegetable garden to flowers. It’s a win-win. You get flowers to cut and the flowers will attract more pollinators to your vegetables. Let’s get started. Just because you’ll be cutting these flowers regularly doesn’t mean you can skimp on the soil. These flowers will need every advantage they can get, to recover from all that snipping. Make sure the area is weed free. Although this garden doesn’t have to look pretty, you still don’t want your plants to have to compete with weeds for nutrients and water. Your cutting flowers will need a soil that is rich in organic matter, to improve water retention and drainage. Work in several inches of compost or leaf mold, before planting. Layout - Ease of access is very important in a cutting garden. Wide rows are the traditional approach. You won’t have to reach as far to cut stems. Be sure to leave paths between them that are wide enough for you move in and work. You’ll be carrying a bucket of water to hold your flowers, so give yourself space to navigate. Plant Needs - Determine what the growing conditions are for each of the flowers you choose to grow and then group those with like needs together. Grouping plants with similar growing requirements will help you give them all exactly what they need with minimal effort on your part. It will also prevent you from unintentionally over or under watering plants that are growing near plants with completely different likes and dislikes. Height - Once you have your plants grouped by their cultural needs, divide them again by their mature height. You don’t want the shorter plants to be engulfed by the tall ones. They won’t get enough sunshine and it will be more difficult to reach them for cutting. Sequence of Bloom - Flowers don’t all bloom at the same time. Consider laying out your plants in the order they are expected to bloom; early season, mid-season, or later in the season. Annuals often don’t last an entire growing season. Make sure you pick up extra seed packets in the spring, so you can reseed when one batch starts to fade. Be strong, if a group of plants is fading, rip them out, freshen the soil with compost, and replant something new. Mulch - Yes, even in a cutting garden, mulch is necessary. It doesn’t have to be fancy or expensive. You can mulch with shredded leaves or even sheets of wet newspaper. No one is going to see it. The mulch is only there to deter weeds from moving in. The last thing you need is another garden to weed. Remember that mulch often needs to be replenished mid-season. If your mulch decomposes to less than 1 inch of covering, it’s time to top it off with some fresh mulch. The most important thing you can do is keep cutting. The more you cut, the more the plants will set new flowers. Isn’t that wonderful? Otherwise, maintenance will be much like any other flower border. Keep an eye out for pests and disease and remove affected plants before the problems have a chance to spread. Make sure your flowers get water at least weekly, more if you’re having a particularly hot, dry summer. You will probably prefer flowers with long stems, since you will be cutting and displaying them. If you love fragrance, make sure you include some scented flowers. Include some filler plants, like baby’s breath or coral bells. Plants with attractive foliage, like artemisia and coleus will also be handy for arrangements. Planting flowers that dry well will extend your bouquets into winter. Grow what you love. If you want sunflowers all summer, give them top priority in your cutting garden. Below are lists of plant suggestions for your cutting garden. It is by no means exhaustive, but it should give you some inspiration. Consider ordering some specialty seed and plant catalogs for exotic or old-fashioned varieties that might not be available at the local garden center. Below are some favorite annual flowers to include in your cutting garden. Perennial flowers also work well in a cutting garden. Choose a favorite variety that you won't tire of seeing year after year.